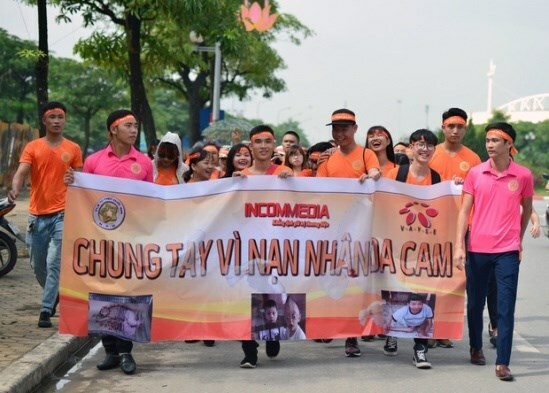 Hanoi (VNA) – About 3,000 people in Hanoi took a walk for Agent Orange/Dioxin victims along streets around My Dinh National Stadium on August 6 to mark the 56th anniversary of the Vietnamese Orange Agent Day. The event, co-held by the National Charity Club (NCC), the Vietnam Association of Young Scientists and Engineers (VAYSE), and Incom Media, aimed to increase local and international awareness of AO/Dioxin in Vietnam and raise funds for the victims. It also supports the quest for justice for affected people and the prevention of use of mass destruction weapons. According to NCC Chairman Pham Van Toi, dealing with aftermaths of chemical warfare and providing care and support to the affected people are long-term and pressing issues today. About 70 percent of families of AO/Dioxin victims are poor, 22 percent of them have more than 3 victims and 90 percent of affected people are unemployed, he said. The walk started at the national stadium, going though Le Duc Tho, Ho Tung Mau, Pham Hung and Nguyen Hoang streets with state employees and students in attendance.